I was watching some vultures at a carcass as I so often do, when three birds broke off into a separate group. Two Lappet-faced vultures had been feeding on the head of a carcass for about thirty minutes when a new pair of Lappets arrived. There wasn’t much left and both feeding Lappets moved off the carcass and flew away without any confrontation. One of the Lappets that had been feeding landed about fifty meters away from the carcass. 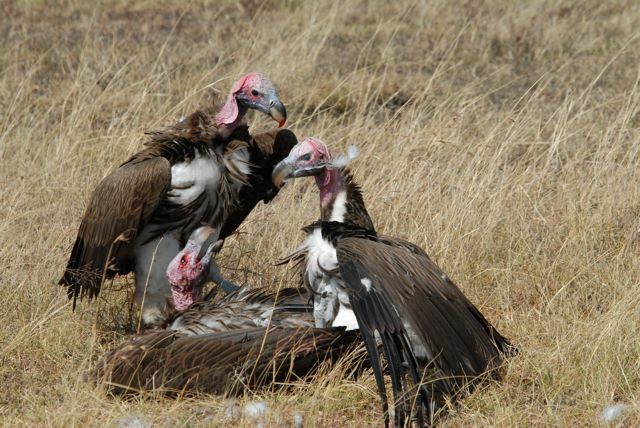 Vultures fight a lot, but what occurred next wasn’t a normal fight. Most fights in the animal world are designed to be competitions. In a contest, opponents show what they have, but they aren’t really trying to hurt each other. Once the bigger, better contestant becomes obvious the smaller ones just move out of the way. That’s not what these three birds were doing. All three were Lappet-faced vultures – my favorite. From a distance, I could just see that the pair of Lappets had the other one pinned and appeared to be pecking at it. When I drove closer, we found that the Lappet’s face had been badly pecked and one of its eyes looked nearly destroyed. One Lappet continued to peck at its face while the other attacker held the Lappet down and took pecks at its chest. After several minutes, the Lappet was able to escape and though pursued was able to hide in some tall grass. The attacking Lappets then returned to the carcass. About a half hour later, the Lappet that had been attacked was able to take off and quickly caught a thermal. The other two Lappets followed it but at a distance and all three quickly disappeared from view as they flew off. This time of year everyone knows the action is by the river. With thousands of wildebeest and zebra crossing Mara river every few days there are sure to be some casualties. Some animals will drown in the rushing water, some will be trampled in the mad rush of the crossing, and some might even fall from the steep riverbanks as their comrades urge them forward. That’s not what people come here to see though. On the top of every tourists list is watching a wildebeest or zebra be consumed by a crocodile. With crocodiles longer than a giraffe is tall, this is the time of year to see what these prehistoric beasts are really made of. The crossing also offers amble opportunity to see vultures – sometimes, at least. So that seemed a good enough excuse to head over there this afternoon after a successful carcass watch and transect this morning. When we reached the water’s edge I was impressed first by the giant crocodile who was basking in the sun. Easily 16 feet and perhaps four feet wide, he was quite possibly the largest reptile I had ever seen. There were two other things that caught my eye when I reached the river. First, a large herd of zebra had gathered on the banks and were calling to their friends on the other side. Perhaps our timing was good and we would get to see them cross. Second, there were some large black rocks that seemed to be floating down the river. When I looked through the binoculars, it appeared that some of the rocks had horns and as the water washed them into other real rocks, hooves were pushed above the surface. The river was literally teeming with dead wildebeest. Bloated and soaked they drifted around like logs, but the reality was much more disturbing. Over thirty wildebeest had drown during the crossing that morning. 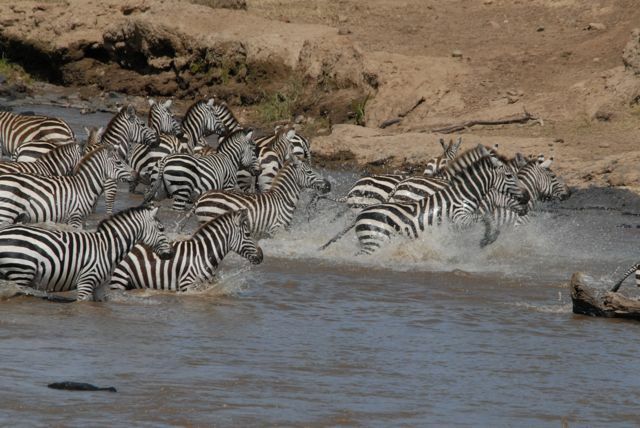 Soon a new crossing was beginning as several hundred zebra took to the water. The line was thin at first with just a few animals starting everyone off, but soon the whole herd had decided to join in. A few crocodiles drifted back into the water and moved towards the herd. I readied my camera. The zebras seemed aware of the crocodiles, but especially in their large numbers they didn’t seemed to concerned. For their part, the crocs didn’t seem to hungry. The zebras stopped to drink and splashed through the water as they made their way across, but the crocodiles kept their distance. Distracted by the floating wildebeest corpses they clearly had plenty to eat already. When the crossing had finished we moved up stream to a small group of hippos. The wildebeest floated among the group, but only a few took interest. Although hippos have an almost completely vegetarian diet, they have been known to make exceptions. So I wasn’t totally surprised, when a hippo started chomping on the passing wildebeest. It didn’t seem to have a great strategy, so most of its biting just seemed to push the dead wildebeest downstream rather than break them apart, but still the hippo tried again and again. He nibbled away at the head, legs, and tails of the floating bodies, but never quite got a bite. Still it was fascinating to watch. When we finally returned to the crocodiles, they were starting to show greater interest in the easy prey. Five or six huge guys gathered around a single dead wildebeest and the rolling began. With great effort, the crocs pulled the wildebeest limp from limp. Nearby a well-fed pair of crocs appeared to have something else on their mind. Coiled around each other rather ackwardly, their tails tightly intertwined it was clear what they were doing even though the female was mostly submerged. They were mating. They bobbed up and down in the water in unison for a few moments before finally dislodging. Then it was back to the shore for a nice sunbathe. The only thing missing from the river experience was vultures – hard to believe given all the food. The only raptor we saw was a young African fish eagle. Transitioning from juvenile to adult, he had a strange pattern around his face and had watched on through the crocodiles munching. Perhaps tomorrow the scavengers would find this smorgasbord of carcasses. Raptor biologists are known for going to extremes to get to their birds. My three trips earlier today to the waste disposal site at Eliza Cove in the Falkland Islands—the locals call it the Stanley Dump–are a case in point. The dump is about three miles from downtown Stanley, the tiny Falkland Islands capital that boasts fewer than 2,500 inhabitants, a single petrol station, and not a single traffic light, and is about 10,000 miles south of Hawk Mountain in the South Atlantic. More than 400 kilometers off the Patagonian coast of Argentina, the Falklands are in the middle of nowhere, but what a beautiful nowhere it is. Aside from its largely uninhabited landscapes, the islands host a singularly unusual resident population of high-latitude Turkey Vultures (the Falklands are 50 degrees south of the Equator), and I have been studying this odd population of scavengers since 2006. Hence my visits to the dump. First and foremost is a genuine conservation concern. 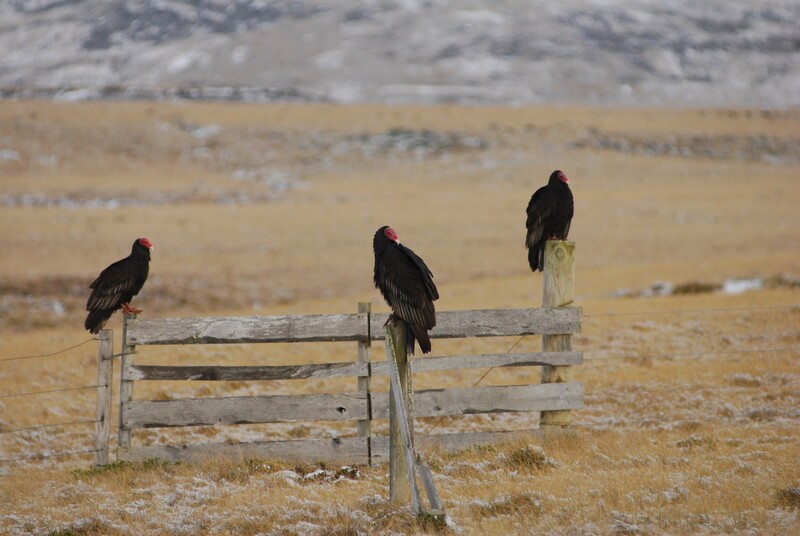 The Falkland Islands government currently issues shooting permits for more than 100 “nuisance” vultures each year (the birds are thought to interact negatively with sheep), and Hawk Mountain’s work in the Falklands focuses on better understanding the impact that this “take” has on the population and how we should best go about eliminating, or at least reducing, it. Which brings me back to the Stanley Dump. Each Austral winter (i.e., late May through late August) more than 100 Turkey Vultures breeding in the countrysides and coastlines near Stanley converge on the island capital, where they use the trash dump as a reliable feeding station and a small grove of Macrocarpa evergreen trees in the center of town as a cozy roosting site. 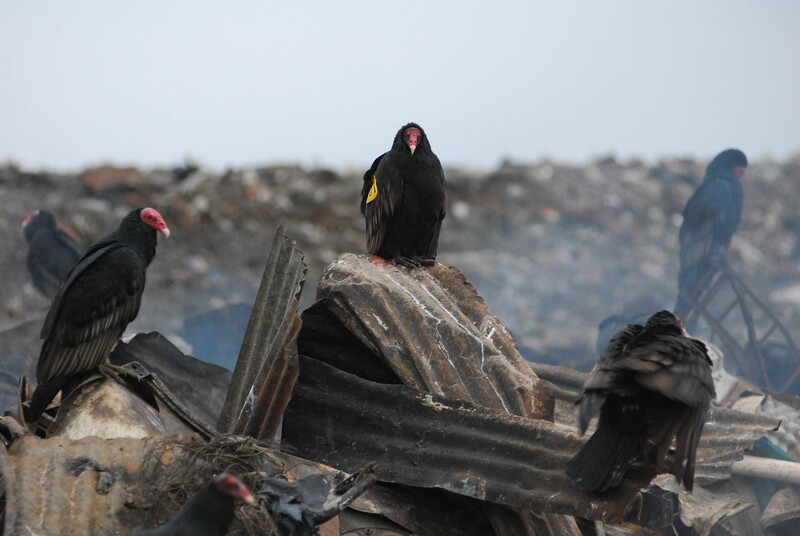 The trash heap/vulture restaurant makes for a perfect trapping site, and that is why I have been visiting it for four of the past five years. In the past we have used large box traps to catch the birds, but this week we are experimenting with 80-pound test monofilament noose lines. The experiment is going well. We are catching vultures. Each bird we trap is first weighed and measured and then fitted with a numbered yellow, herculite wing tag. Falkland Islands Conservation, the local Birdlife International partner on the islands, acts as the “call center” for reports of tag re-sightings, and the accumulating information coming in from the locals and tourists visiting the islands is helping us study the movement ecology of the birds. Earlier this morning I counted 89 vultures at the dump, one of my highest tallies ever. Unfortunately none was sporting one of the 50 bright yellow wing tags we have tagged them with since 2007. My mid-day count shrank to 19, but one of the birds, tag number 02, had been marked at the dump in the winter of 2008. My trapping colleagues Marc, Sam and Roo, and I baited the area with cattle rib-cages at 1 PM and came back again at 3 PM to set our traps. We caught our first bird in less than five minutes, and a second 20 minutes after that. Both were tagged and released within minutes. Our only problem today was by-catch. Hundreds of Dolphin Gulls and Kelp Gulls also feed on refuse at the dump, and we caught several of each in our monofilament snares. Carefully removing them without being bitten is something of an art, and we are still learning how to do it properly. That said, today has been a good day both for re-sightings and trapping. Tomorrow I leave on an afternoon flight to Chile, Brazil, and then on to Newark, New Jersey. The plan is trap for several hours tomorrow morning as well. The work is slow and steady, but exceptionally exciting nevertheless. A master’s degree thesis currently completed by Brandon Breen, a University of Minnesota graduate student supported by Hawk Mountain, will summarize the first three years of our work. An additional three years of study, which will include capturing, wing tagging, and following Caranchos (Southern Caracaras) and Johnny Rooks (Striated Caracaras)–two other prominent scavengers on the islands–is in the works. I plan return the Falklands next July for more visits to the Stanley Dump. But before I do, I will make certain I wash my boots and field clothes. The dump stinks.